I love this quick on-the-go salad as it literally requires not much more than placing a few delicious and healing ingredients in one bowl. This is often my go-to quick dinner or lunch. You can have it over a slice of a gluten-free bread, a bowl of grains like rice or quinoa or with a piece of meat. Sauerkraut can be sour and intimidating if you are just starting out on this journey. 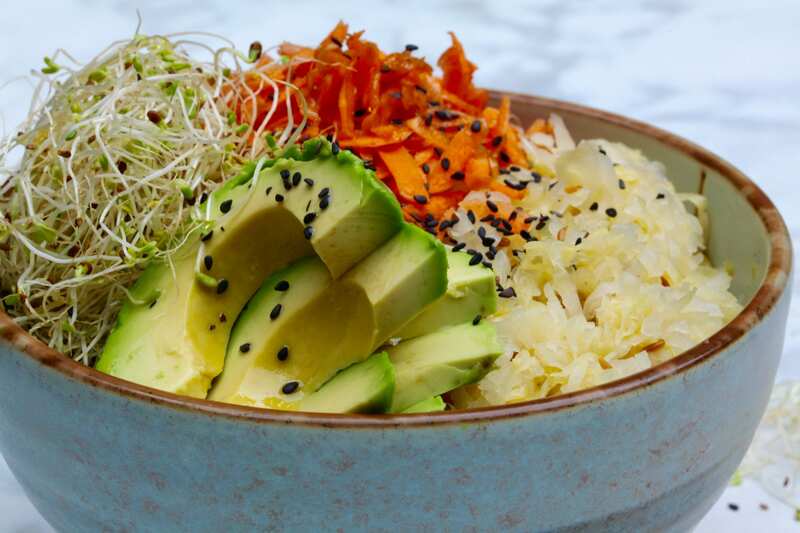 Adding fats like avocado and olive oil help balance out this salad and reduce the acidity of the kraut. I added some broccoli sprouts for their nutritional super powers. Apart from having estrogen- and liver-detoxifying properties, they also contain high levels of sulforaphane which has been linked to be as effective in the management of breast cancer as Tamoxifen, without the side effects. Sauerkraut contains high levels of vitamin C and B vitamins (much higher bio-availability compared to raw or cooked cabbage) and is packed with probiotics that help rebalance your gastro-intestinal health. Be sure to pick the lacto-fermented form of sauerkraut, typically found in the refrigerated section of the store. You do not want to pick up kraut in vinegar as it lacks any probiotics. Combine sauerkraut and cumin seeds. Add all other ingredients into a serving bowl. Sprinkle sesame seeds if using. Could I just make home made kraut for this recipe? If so, how do you recommend I make it?